See in Glossary view or the Game view to access the Gizmos menu. Selection Outline Check Selection Outline to display selected GameObjects with a colored outline, and their children with a different colored outline. 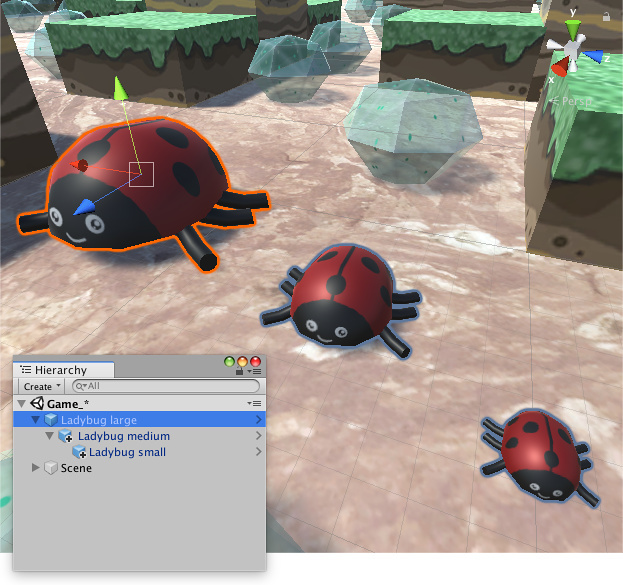 By default, Unity highlights the selected GameObject in orange, and child GameObjects in blue. 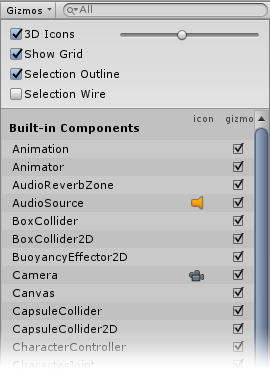 NOTE: This option is only available in the Scene view Gizmos menu; you cannot enable it in the Game view Gizmos menu. See in Glossary Gizmo and Light direction Gizmo (shown below) are both examples of built-in Gizmos; you can also create your own Gizmos using script. See documentation on Understanding Frustum for more information about the Camera. When Selection Outline is enabled, an outline appears around selected GameObjects and their child GameObjects. 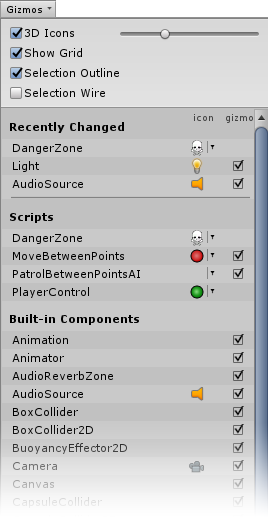 By default, Unity outlines selected GameObjects in orange, and child GameObjects in blue. 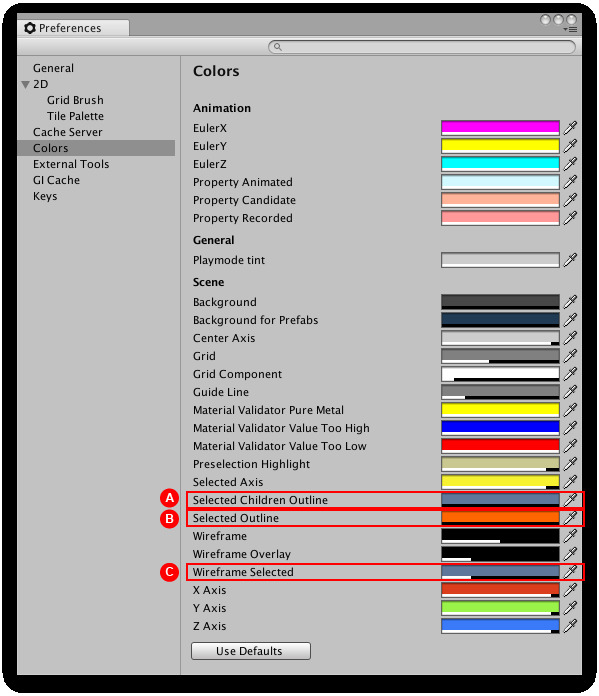 You can change these colors in the Unity preferences (see Selection Colors, below). 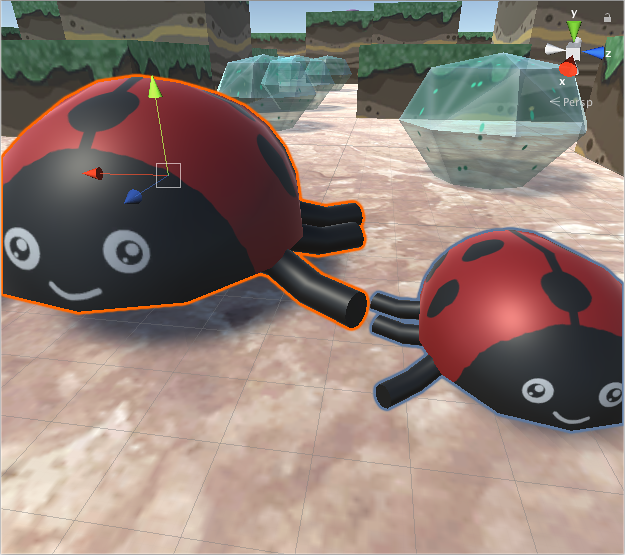 Selecting a GameObject (the large ladybug) outlines it in orange, and outlines its child GameObjects (the smaller ladybugs) in blue. When you select a GameObject, Unity outlines all of its child GameObjects (and their child GameObjects, and so on), but does not outline parent GameObjects (or their parent GameObjects, and so on). 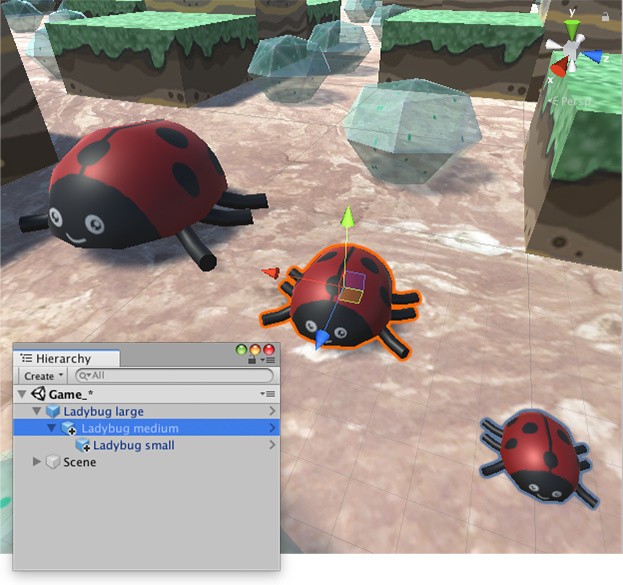 Selecting the medium ladybug highlights it in orange, and highlights its child GameObject (the small ladybug) in blue, but does not highlight its parent GameObject (the large ladybug). You can set custom colors for selection wireframes. Go to Unity > Preferences (macOS) or Edit > Preferences (Windows) to open the Preferences editor. (A) Selected Children Outline: outline color for selected GameObjects’ children. (B) Selected Outline: outline color for selected GameObjects. (C) Wireframe Selected: outline color for selected GameObjects’ wireframes. See in Glossary have a predefined wireframe Gizmo to show their shape, and Cameras have a Gizmo which shows the view frustum. Your own scripts can draw custom Gizmos appropriate to their purpose; implement OnDrawGizmos or OnDrawGizmosSelected to do this. Uncheck the checkboxes in this column to turn these Gizmos off.